I had big plans for these Easter holidays on the baking front but a combination of , sickness, an early Easter and unseasonably hot weather meant I conked out after baking a batch of Greek Easter biscuits and this fruit loaf. I baked my Easter biscuits on Thursday night while I binged watched Chef’s Table on Netflix, a documentary series on chefs that I find strangely addictive and soothing. My fourteen-year-old son and niece introduced me to the Chef’s table. My son now spends most of his time at home in his room so it’s always nice to be able to bond over a bit of shared television viewing and even though he has a disconcerting ( and slightly irritating) habit of reading his Reddit feed on his phone while watching the telly, it’s still its family time! Most of the food featured on the Chef’s Table is esoteric, haute cuisine that is nothing like the food my son or I would actually want to eat but the passion and creative commitment of the featured chefs is absolutely inspiring. I had planned to get up and bake Maggie Beer’s Easter buns on Friday Morning and I was finally (after many years) going to make Ottolenghi’s chocolate babka for Easter Sunday but the heat didn’t just steal my baking mojo, the eating of chocolate became less appealing. I’m writing this late Easter Sunday afternoon, I ate muesli for breakfast, a tempeh sandwich for lunch. I’ve had the grand total of two Haigh’s caramel mini-eggs for my Easter Sunday chocolate binge and I really ate them out of a sense of duty to tradition because after all it’s Easter and some chocolate has to be consumed. I’m disappointed about missing the opportunity to bake Ottolenghi’s babkas, the sense of occasion needed to go to the trouble to bake a yeasted chocolate loaf is limited. I was going to postpone the babka baking until the Greek Orthodox Easter but that’s early this year too and is only week away. I might have to make my own occasion and bake chocolate babka as a spontaneous celebration when the cooler weather hits. Enough of my baking disappointments! 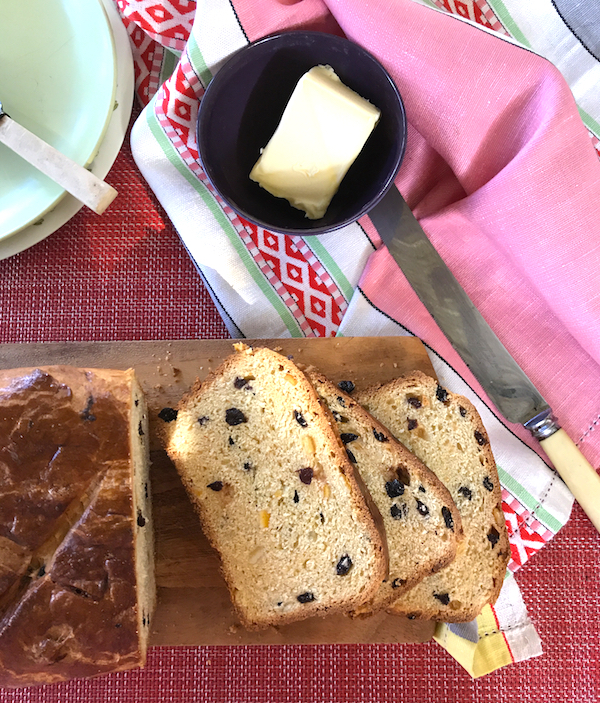 I baked this saffron fruit loaf on Good Friday and we didn’t get round to eating it until Saturday morning, but this loaf is not only a good keeper it toasts excellently (in fact it’s probably better toasted). It’s kind of like a cross between a brioche and cake. I’ve never really understood the appeal of saffron, it had always seemed like an expensive yellow food coloring but baking this loaf has made me a saffron convert. 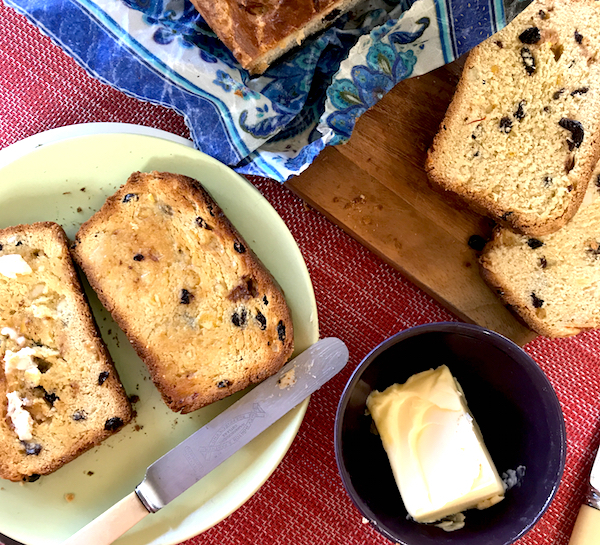 It gives this fruit loaf a mild honey-like sweetness that is incredibly seductive and luxurious. Stir saffron threads into hot milk and leave to infuse for 1-2 hours. Mix flour and salt in a bowl and rub butter through until it is the consistency of fine crumbs. Mix through brown sugar and make a well in the centre of the flour. Reheat milk until luke warm. (you don’t need to bother to strain the saffron threads) Combine yeast a few tablespoons of milk and mix well, Stir in the remaining milk and add to the dry ingredients. Mix with hands into a dough. If using a stand mixer transfer to the mixer bowl and knead with a dough hook for 10 minutes or until the dough is smooth and silky. Toss fruit in one tablespoon of flour. (This stops the fruit sinking to the bottom of the loaf during baking) Add fruit in two lots, kneading well after each addition. Grease a 20cm x 10cm loaf tin with butter. Shape and place dough in tin and cover with a tea towel and place in a draft free place for 1 to 1 1/2 hours until doubled in size. When the loaf has risen, brush top with beaten egg and slash top with a sharp knife. Bake in oven for 50-60 minutes until loaf is golden brown and loaf sounds hollow when tapped. Remove loaf from tin and cool on a rack. Allow loaf to rest for an hour before slicing. Serve with butter or ricotta with jam. This loaf keeps well and is brilliant toasted with butter.